The story of the Straus family, which has played an important part in the history of the Macy store, is no less romantic. The head of this family was Lazarus Straus. He and his wife Sarah lived in a little Bavarian town along the Rhine, and there on February 6, 1845, was born to them Isidor. Three years later came Nathan on January 31, 1848, and then Oscar S. on December 23, 1850. Father, mother and three sons came to this country in 1854 and settled in Talbotton, Ga. The boys received the nucleus of their education there, Isidor later being graduated from the Washington and Lee University, Nathan coming to this city and finishing in the public school here, while Oscar was graduated from Columbia College. Isidor was anxious to enter West Point, but the Civil War made this impossible. Two years later opportunity came for him to go to England as agent for an importing company undertaking certain shipbuilding contracts. He was in Europe until the end of the war. His father, meantime, had removed to Columbus, Ga., and was thinking seriously of going to Philadelphia to start a new in business. The son favored this city. 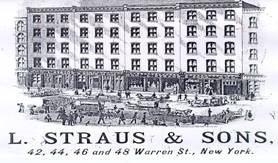 His advice prevailing the family came to New York and the firm of L. Straus & Son was formed to deal in earthenware in Warren Street. Success led them to branch out soon into porcelain and glassware, and as the other sons of Lazarus Straus came of age at which they could enter business the firm name was changed by making a plural of the second section. Caption: The showrooms of L. Straus & Sons on Warren Street. In 1874 the firm of L. Straus & Sons opened a china and glassware department in R. H. Macy’s & Co.’s. In the early part of 1877 Mr. Macy’s health began to fail and he was ordered by his physician to try the efficacy of the German baths. When he arrived in Paris he was too ill to proceed further. His strength rapidly declined and he died in the latter part of March, 1877. Mr. LaForge and Mr. Valentine then took over the firm’s business. Mr. LaForge died the next year and Charles B. Webster succeeded him. Mr. Valentine died in 1879 and Mr. Webster conducted the business which continued to grow. The Messrs. Straus devoted their time and energy solely to the china and glassware department until 1888, when they were taken into the firm, the partners then becoming Mr. Webster, Mr. Isidor Straus and Mr. Nathan Straus. Under the new management the various departments of the house were enlarged, until a gigantic business was developed. Courtesy of the Federated Department Stores. 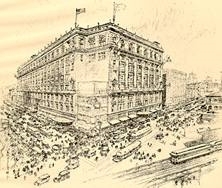 The Straus brothers were among the first to recognize that the great shipping section of the future was to be located in the neighborhood of Greeley Square, and on May 15, 1901, the firm made public the fact that they had bought twenty-two pieces of property on the west side of Broadway, between Thirty-fourth and Thirty-fifth streets. History has shown that the Straus family had picked the perfect location for their new store. Macy’s continues to have a very active retail establishment at this location.